Arti has a unique style of writing, something very near to original and natural. Her writing takes you along for a deep dive inside an ocean but keeping your entity intact. 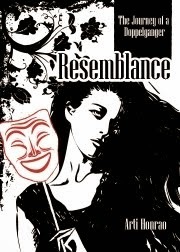 In this book Resemblance: The Journey of a Doppelganger, Arti has tried to depict the difference of good performance done on a stage in front of a large amount of audience and get applauded for it and the same when required to be done in real life in front of real life acquaintances and sometimes even in front of totally unknown people.